What is the Gastric Sleeve Surgery for weight loss all about? Despite cutting down on sugar or carbs, exercising regularly and scrutinizing every menu as if you were about to have an exam – sometimes your stubborn waistline still doesn’t get the message that you want to lose weight. If you’re like some people, losing weight beyond a particular point seems no less than a miracle. Even though dieting has been a mission of yours since as far back as you can remember, your body seems to have a different idea about what you need to weigh. Does the story of chronic dieting – without long term weight loss – ring a bell? It likely does. Sadly, this story is shared by millions of overweight and obese individuals. The burning question here is this: is there another way that people prone to obesity can help their bodies release stubborn fat, and being a path towards better health – instead of continuing to be dangerously overweight or chronically losing-then-gaining weight? The good news about weight loss is this: YES, they can. It’s certainly not a first resort and still requires an altered lifestyle – sustained over time. Yet surgical interventions such as gastric weight loss surgery can be a good option for people who can’t seem to lose weight by other measures. What we’re discussing here is a laparoscopic procedure called a Sleeve Gastrectomy (which we’ll refer to as a “gastric sleeve” in the rest of the article). The increasing burden of obesity in modern society has led to new surgical treatment options being developed to encourage weight loss. These are very effective in helping tackle obesity and the co-morbid conditions that directly or indirectly relate to having a dangerous BMI or obesity-level weight gain. You might be hearing the term ‘gastric sleeve’ for the first time. If so, you might find it surprising that in 2013, 42% of the bariatric (obesity or weight loss) procedures performed were that of gastric sleeve. Source: American society for Metabolic and Bariatric Surgery. Gastric sleeve surgery (also known as a Sleeve Gastrectomy), is a Bariatric Surgical procedure that involves longitudinal resection of the stomach. It reduces the size of the stomach by up to 75% in order to help an obese patient restrict their intake, in order to lose significant weight and regain health and mobility. It is one of several varieties of gastric surgery for weight loss, as shown in the illustration below. Following resection, the patient is left with a banana shaped pouch (or “sleeve”) that accommodates the food the patient is able to consume after surgery. This is approximately 150 ml of food intake at a time. 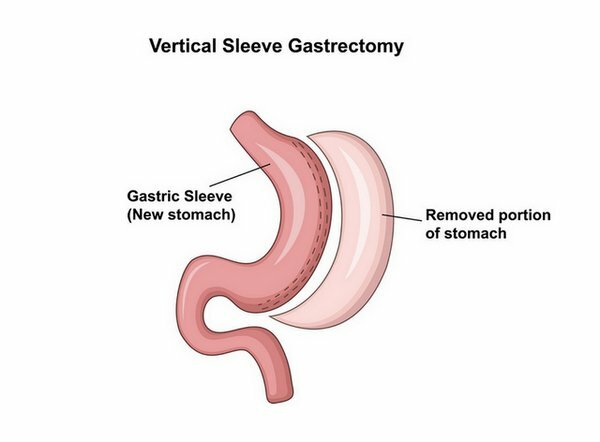 There is also a mini-gastric bypass procedure, as shown in the illustration below. The Gastric Sleeve procedure can take a few hours, and is usually performed within 1 to 2 hours. It is typically carried out under anesthesia ideally in a fully accredited facility by a specialist surgeon (Bariatric Surgeon) who has performed hundreds of similar operations on overweight and obese patients. It involves making 4-5 small incisions in the belly area to introduce the scope (camera like equipment) and related surgical instruments. Once removed, the remaining part is sealed with staples. However, sphincters and intestines are untouched during the procedure. The selected hospital and the Bariatric Surgeon must have proven capacity to work with obese patients. That’s because obese patients are often at a much higher risk of surgical complications, including serious or life threatening complications. That’s because people who are obese tend to have chronic health conditions that can make surgery risks much more likely to occur. However, the risk of NOT having surgery – the risk of remaining morbidly overweight – is also taken into consideration by the patient and Surgeon; often, the surgery is the better option than leaving the patient ‘as is’ with obesity related morbidity. All bariatric patients will need to properly prepare for Surgery and this includes getting as healthy as they can (and losing weight) BEFORE the surgery, not just afterwards. It is a straightforward, irreversible procedure that restricts the size of the stomach, thus forever limiting the quantity of the food that can be consumed. Gastric sleeve surgery, pretty much like the rest of the weight loss surgical procedures, only kick-starts weight loss in people who are obese. It doesn’t offer a permanent solution in any way, and lifestyle changes MUST be made (not making them can leave the surgery patient very, very ill). If you opt for a bariatric procedure, you will have to maintain your weight loss through lifestyle modifications, a healthier eating routine than you had – and a commitment to exercising regularly – once you’ve crossed the safety checkpoint after surgery. After a gastric sleeve surgery, you will only be able to consume smaller portions of food. You’ll need to eat a moderate diet, avoid certain food types and avoid large portions for optimal results. You’ll also need to stay fit and healthy through regular exercise; and other lifestyle or behavioural changes. This includes maintaining positive mental health once food fails to become an available source of emotional comfort for your daily upsets. If you were using food as a reward system, or to soothe an upset psyche, then counselling and frequent monitoring by a mental health professional is optimal after a gastric sleeve procedure. With the right counselling, you’ll develop NON-food based ways to moderate your emotions or cope with stress. 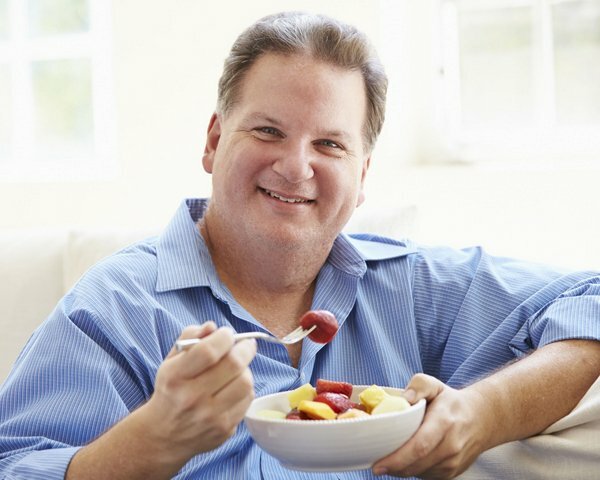 First a few days after your surgery, expect pain, discomfort – and to have to adapt to a purely liquid diet for the first part of your journey after getting Gastric Sleeve Surgery. While you’ll be given painkillers to take care of the discomfort and pain, there’s absolutely nothing that you can do to change the requirements for an early liquid diet. Once your Surgeon gives you the green light to move on to the next step, you’ll be good to go to the next level. That’s often pureed food, followed by semi-solid foods. Finally, you’ll be able to move on to solid foods, but in much smaller proportions than before. Again, it’s all about moderation, only with a gastric sleeve, you’ll fill up much more quickly – and you’ll physically be unable to consume a healthy amount without feeling very, very unwell. How much time you spend on each stage of food transition (from liquid diet to select solid foods) will be determined by your Bariatric Surgeon and your overall nutritional care team. Bottom line: there’s going to be gradual progression to solids after surgery. Starting solid food before time can turn out to be harmful for you. Obesity: Is Gastric Sleeve Surgery an Option For You? How would you know that gastric sleeve surgery, versus another procedure – might be the ultimate life saver for you in relation to co-morbidity and Obesity? You’ll need to consult with your GP for a referral, then with a select Bariatric Surgeon Specialist to know for certain if this surgery will suit your needs. You’ll have needed to first attempt nearly every other non-surgical approach before you choose surgery. That’s because surgery is serious, and there are side effects and potential risks to consider before you consent to either a gastric sleeve or other weight-loss surgery. If you have one or more of the following, you might make an ideal gastric sleeve candidate (but only your surgeon can assess this for certain). Most people also need to lose weight BEFORE their surgery, not just after, so read our Tips on Losing Weight Before Surgery (visit Dr Geoff Barnett’s page). How is the Weight Loss Pattern After Gastric Sleeve? While weight loss with a sleeve operation may not be as large as that in Gastric Bypass surgery, the pattern is more or less similar. However, how quickly you lose weight and how far you’re able to maintain depends on how healthy your lifestyle is. One year later, 60% of excess weight is lost. Is Weight Loss the Only Benefit of Gastric Sleeve? While the procedure is majorly a treatment option for obese people to shed excess kilos, it’s a fact that the procedure has various health benefits. It can lead to an improvement in various health conditions that are a consequence of obesity or worsened by having an unhealthy BMI. Understand that when you’re obese, you’re not just overweight, you’re seriously overweight. When you’re seriously overweight, your health is also seriously compromised. Bottom line: Gastric sleeve is a lot more than a simple weight loss procedure. It has an impact on your overall health. To learn more about the bariatric procedure and its impact on your body, weight and various aspects of health, feel free to contact us or visit www.newbodyspecialists.com.au for information on Bariatric Surgery. Our skilled Plastic Surgery body contouring team can also suggest some of the most professional & experienced Bariatric Surgeons in your area, as well as advise you about post-weight loss body contouring surgery such as liposuction, a belt lipectomy, tummy tuck, arm reduction or thigh reduction procedures – which are commonly needed by formerly obese people who have lost weight. Contact us for information on how to choose a Bariatric Surgeon and what to expect in terms of post-weight loss body contouring or skin tightening surgery after you have lost a lot of weight.